A bathroom renovation can mean different things to different people. While some consider it a fresh coat of paint and new bathroom fixtures, the true renovation begins with an empty room and exposed studs. The first order of business before beginning any renovation is cost containment. The second is to answer simple questions. Is it really necessary to remove and replace walls? 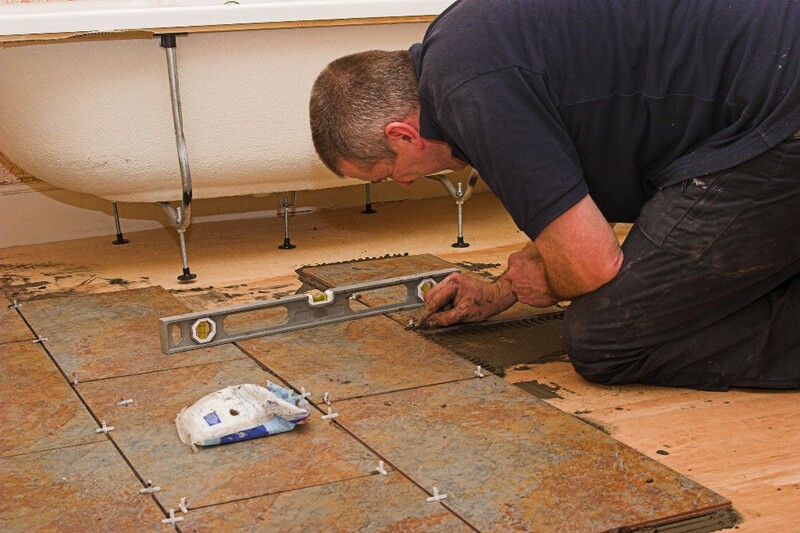 Will a vessel sink or copper sink increase the value of the home as much as new flooring? Will today’s fad be popular tomorrow? Is a granite countertop necessary? The best answer is the budget. Bathrooms do not age gracefully, yet they are very often the last to be renovated. If the homeowner can do all of the deconstruction, renovation, plumbing and electrical work involved the sky is the limit. However, if the budget conscious homeowner is hiring a contractor, the dreams of Jacuzzi bathtub, heated marble floors, and crystal chandeliers may be replaced with more practical fixtures. The biggest issues in renovating are the many decisions.. .
What works, what does not? What stays; what goes? Generally speaking, the bathtub can stay. Nicks and scratches can be repaired while the tub color, tub fixtures, and shower head can be changed. It is less expensive to add a shower to a bathtub than it is to replace it with a walk-in shower. Unless the plumbing is very old, the sink and commode can be easily replaced. Assuming the homeowner is not going to undertake a total renovation the place to begin is a home builder’s center that has a design department. Be sure to take the bathroom measurements – width x length x height – and a sketch of the current room layout including window and door. The designer can make suggestions as to what will or will not work in the available space. The greatest expense is plumbing. The base cabinet, sink and bathroom fixtures can be changed, but a four-foot base cabinet can easily cost $600. Sinks can be as simple as a replacement, or it can be under-counter, over-counter, vessel sink, copper sink, enamel design overlay or colored enamel. Fixture selection can be just as daunting in price and design. It is all part of the ‘look’ the homeowner is trying to achieve. The finished look can include everything from a copper sink with matching bathroom fixtures to faucet shape and design. Commodes come in various heights, colors and bowel shape. The young family generally does not need a commode that is 16″ high as it is more suitable for seniors than a small child. The base cabinet and countertop are generally considered after the features are selected. The cabinet base comes in many colors and styles from a furniture grade finish to the ready-to-stain, or paint, unfinished wood. Countertops can be granite, ceramic tile, engineered stone, marble or laminate. Granite colors are extremely popular as there is approximately 1000 colors and designs to choose from. Granite is no longer limited to one color, but it can be cost prohibitive as it ranges from $50 -$200 per square foot. Granite does increase the value of the home as much as new smart bathroom flooring such as cork or bamboo. Many of the beautiful granite colors are also available in other countertop materials. Granite, ceramic tile, and some of the other popular countertops require special care whereas the laminate does not. Bathroom decor, lighting, and accessories such as drawer pulls and door knobs, toilet paper holder and soap dish require attention to detail. Lighting is the most important feature of the bathroom regardless of the style, be it a hanging light, an over the sink light, a wall mounted light or a ceiling fixture. Whether or not a hanging light can be installed is dependent upon ceiling height and the intended use. A 14 foot ceiling and excellent ventilation is why it is possible to hang a chandelier in a room-size shower. Most lights that hang are installed in a large bathroom from a ceiling more than 9′ high for maximum lighting and effect. However a great mirror and proper lighting may be a better bargain for the budget conscious buyer. Bathroom decor is very much a personal opinion. Baskets filled with washcloths tied with ribbon, or sample-size gifts for guests, can be just as effective as wall decorations such as small glass shelves or accent mirrors. On the other hand a unusual piece of art work or a great painting can be just as captivating. It is all about space. Whether it is wall decorations or baskets, bathroom decor comes down to budget.